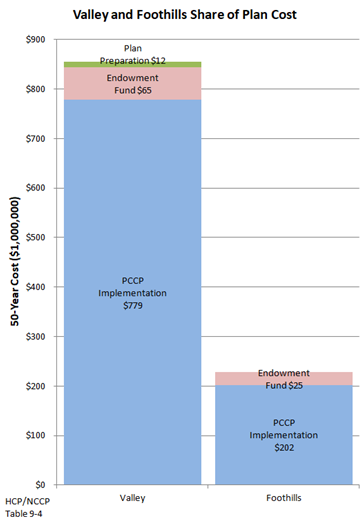 preparation costs are not included in the Plan cost chart, above. After the permit-term, annual costs are less—estimated to be on the order of $3.3 million per year. The biological resources present and the greater extent of future growth in the Valley dictate that roughly four fifths of the overall Plan cost will go to implement the Valley Conservation Strategy. Plan funding will come from a combination of local, state and federal sources. The local share is projected to cover 77% of Plan cost and will mainly come from development fees from Covered Activity projects. The City of Lincoln and the County will not be committing general funds to pay for the Plan, but development fees will apply to public projects such as roads and bridges covered by the Plan. Estimates of local funding from Valley and Foothills development fees are based on scenarios of expected future land development and public projects in each area. Expected state and federal grants would be proportional to projected costs so Valley and Foothills funding balances Valley and Foothills cost. committed to the PCCP in advance, there are several present programs that may be available. For some projects, the fee payment can be split across several steps. Under certain circumstances, private applicants may fund all or a portion of fees with a special tax or special assessment or dedicate land to the Reserve System in lieu of development fees. 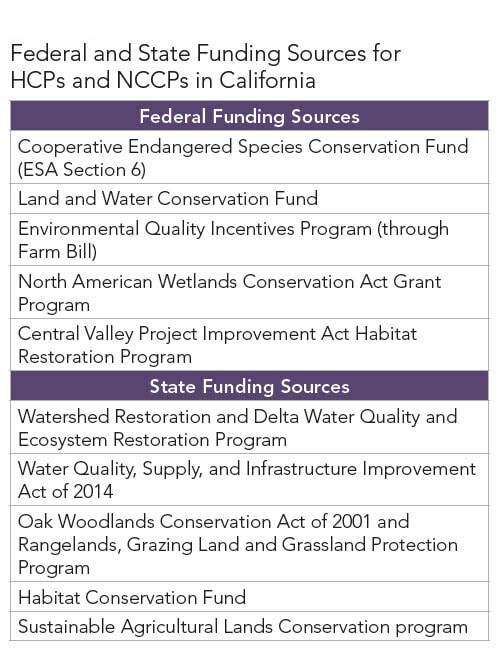 Every five years, the PCA will complete a fee assessment in coordination with the Wildlife Agencies to review the costs and the underlying assumptions of the original funding plan, to evaluate trends in covered activities such as the rate and density of land development, and to estimate the remaining costs to implement the HCP/NCCP. The PCA will adjust fees based on this analysis. cover type present. The basic fee is set to provide funding for the establishment of the Reserve System overall, averaging across the costs of acquisition and management of the various natural communities to be protected. Because of differences in both the biological resources present and the character of future land development, the Valley and the Foothills do not have the same fee schedule. In the Foothills much of the impact on habitat and species results from development and fragmentation of large parcels so smaller parcels already existing at the time the Plan is adopted pay lower land conversion fees. These fees will apply wherever covered activities affect wetlands or the Stream System. All special habitat fees are paid in addition to the land conversion fee. 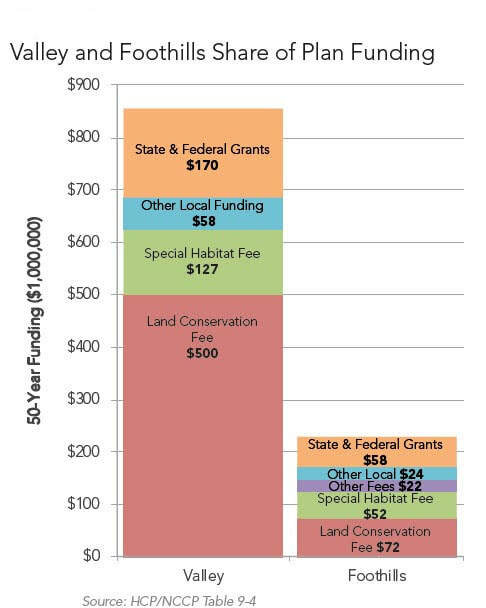 The special habitat fees mitigate loss of specific, valuable habitats and are set to provide adequate funding for restoration and enhancement; the fee varies depending on what habitat is affected. These fees are assessed at 2% of listed permanent fees and apply only when a natural community is restored within one year of initial ground disturbance. This condition will usually not be easily met and temporary fees will apply rarely and to projects such as stream channel maintenance, pipelines or lay down areas adjacent to short term public works construction.